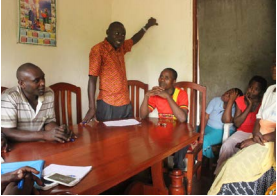 Ernest Masereka, a voluntary community health worker and key influencer from Rutoke village, Uganda, introduced his community to the idea of forming a village health club in December 2017. Village health clubs provide forums at which community members can disseminate messages and address different issues, such as sanitation, health and savings. Members of the club collectively come up with action plans and local solutions for the challenges their community faces. Club members, Ernest suggested, could also contribute 1,000 Ugandan shillings every month for the community to use to address health issues when needed. The community welcomed this idea and in January 2018 a village health club was formed and members began contributing to what they referred to as the ‘ambulance fund’. Since 2016, USAID’s Malaria Action Program for Districts (MAPD) has been working with the key influencers to reduce the malaria burden in Uganda. Their role is to sensitize their communities on the dangers of malaria, the importance of seeking early treatment within 24 hours of symptoms, and preventive practices. This is done through monthly home visits and, when they exist, through community dialogues via the village health club. In September 2017, MAPD, implemented by Malaria Consortium in partnership, identified and trained 32 key influencers in malaria prevention, treatment and interpersonal communication and one of their deliverables was to establish village health clubs. Thanks to Ernest’s encouragement, his community’s village health club is already proving a success. When Bagonza’s son got sick in May 2018, he took him to a nearby health centre where he was diagnosed with malaria and received treatment. However, his condition became worse after a week and he was referred to St Paul’s hospital 10 kilometers away from his home in Kasese town. Bagonza did not have enough money at the time, so he spoke with the chairman, treasurer and secretary of the village health club in his village and managed to borrow 40,000 Ugandan shillings. With this money, Bagonza took his son to hospital and bought a few other necessary items, such as sugar, soap and food. This was officially communicated to the village health club members at the next meeting and a repayment schedule was established for Bagonza to replenish the Ambulance fund. 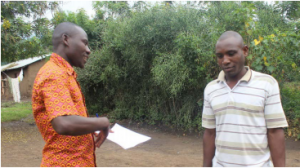 MAPD plans to increase the number of key influencers in the Kasese district from four to 10 to extend its reach in promoting behavior change and reduce the malaria burden in the district. Since key influencers and community members are accountable for the success of village health clubs, this will ensure the sustainability of MAPD’s impact even after the project ends. This success story is published as part of a series from the USAID’s Malaria Action Program for Districts project. USAID’s Malaria Action Program for Districts aims to improve the health status of the Ugandan population by reducing childhood and maternal morbidity and mortality due to malaria. The project will support the Government of Uganda for a period of five years, focusing in particular on children under five years of age and pregnant women. This project, made possible by the generous support from the American and British people, is implemented by Malaria Consortium in partnership with Jhpiego, Banyan Global, and Communication for Development Foundation Uganda (CDFU), Deloitte Uganda and Infectious Diseases Institute (IDI).